The socialization of the Web has brought about changes to how, when and where we communicate with each other over the Internet. The same goes for companies who now look for and hire new staff by using online software, social networks and whatnot, although that shift – to what is often referred to as ‘social recruiting’ – is perhaps far less visible. Jobvite, a developer of software that enables companies to leverage the social Web for finding and hiring new employees, was one of the first to spot this trend a few years ago, and the startup is today growing faster than ever. We’ve learned that the company has raised $15 million in Series C funding, underscoring its momentum. The financing round, which brings the total of capital raised by Jobvite to over $30 million, was led by Trident Capital and joined by previous backers CMEA Capital and ATA Ventures. John Moragne, co-founder of Trident Capital, will join the company’s board. 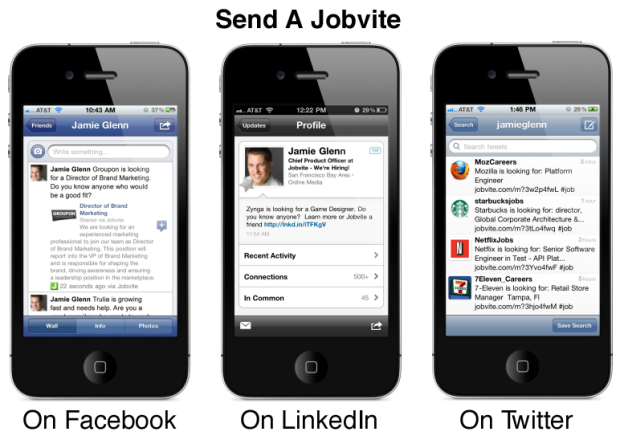 Jobvite offers social recruiting applications used by over 500 companies today – its customer base has grown to 600 percent the size it was just two years ago – and counts well-known Internet companies such as Zappos, Yelp, Groupon and Twitter among its clients. Other notable customers include WholeFoods and Starbucks. The company offers its Web-based social recruiting apps and an applicant tracking platform on a subscription basis, which center around driving referral hires by leveraging dozens of social networks and other digital communication platforms. Notably, the software isn’t designed to be used exclusively by recruiters or hiring managers, but can easily be used by all employees. Jobvite also provides realtime analytics, allowing managers to see the status of searches, identify areas for improvement and optimize recruiting spend. The company claims its customers hire 10 percent of referral applicants compared to 1 percent of general applicants. Jobvite cites examples from its customers TiVo, whose referral hires have risen from 23 percent to 39 percent in three years, and Shutterfly, who it says hires referral candidates at 12 times the rate of applicants from other sources. Jobvite competitors include Firefish, Sendouts and Taleo, among many others.